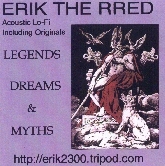 Here is the story of "Legends, Dreams, and Myths"
I think it was the year 2000 when I had accumulated enough original material to make an album. I awoke one morning, while the diurnal ascendant of my birth's chart was in 7 Scorpio, and God told to me, make the "deposit" right now. A "deposit" is the sample of one's work that is sent to the copyright office for the office's records. and started singing into the cheap portable cassette player that somebody had left on the street near to my thentime abode, "Sunnybright." I was thinking that I would have to record these songs all over again, after exercising my voice for a couple of weeks, before making them available for sale. while I re-did others for his tape. when Dave Mitchell, one of the two owners of Kramer's Deli in Frostburg MD, said to me that he liked so much the sound of my Lo-Fi cd, "Happiness Teacher,"
that he thought I should do more lo-fi cd's, instead of using the nice equipment. the lo-fi tape made on the cheap cassette player. At that point I realized that my God was trying to help me to find the way to career success in marketing cd's. People LIKE my lo-fi acoustic music. Fine. I like it too, and play it over and over again at home. So I went to the maker of my first cd, "Happiness Teacher," whose name is Marc Slanger, and we arranged to "capture" the music from my tapes to make two more lo-fi cd's, LEGENDS, DREAMS, and MYTHS, and HYMNS AND HISTORIES OF JESUS CHRIST. ERIK's Popular Lo-fi Acoustic Bluegrass/Folk/Rock style, using Jimmy Arnold's old Ovation guitar. 14) Apology for Robin Hood (original). Robin Hood and the Stranger (instrumental - original tune). Robin Hood and the Widow's Three Sons (instrumental - original tune). 14) APOLOGY FOR ROBIN HOOD: I wrote the words and the tune of this one because, in the early 80's, I conceived of dedicating a whole album to Robin Hood, and I wanted to give a brief background. So I paraphrased the first page of the "Robin Hood" section from one of my mother's childhood book collections, called, "My Bookhouse." Robin Hood was as a god to me, since, in the early 50,s at a time when I was needing role models, a show appeared on television, entitled, "Bill Wells Tells." I think it was a local Washington DC show. Bill Wells was an artist/storyteller, who would simultaneously tell a story, while drawing an illustration of the story as he talked. Later, in the early 80's, as I was searching for existing songs for exemplifying the traditional warrior spirit of our people, I discovered, in another of my mother's series of books, two old Robin-Hood ballads, without any music. They were "Robin Hood and the Stranger," and "Robin Hood and the Widow's Three Sons." I composed tunes for both of these, and learned to play them on guitar, with a droning bass played with my right thumb, as you can hear on the cd. For "Robin Hood and the Widow's Three Sons," I tune the "E" string down to "D". 15) HE LEADETH ME: While Uranus was transiting my ascendant, in the late 80's, I was living in Annandale, VA, with my close associate, Adele Wilson. I used, in that time, to visit numerous "Spiritualist" churches in Washington DC and Virginia. One of them was called The Church of the Two Worlds, in Georgetown, Washington DC. There was a quite Traditional Southern flavor to the songs and services there, whereas I had been upraised in the New England tradition of the Congregational Church. So there I became acquainted with specifically two hymns that took a liking to me, this one and "Sweet Hour of Prayer." In the spiritualist hymnal, somebody had changed the words of this one to "He Healeth Me." Or maybe it was one Sunday the management circulated a separate piece of paper with that change on it, not in the book. 16) HYMN TO APHRODITE - I did this one in the early 80's also, being interested in many gods and goddesses at that time. This is Percy Shelley's translation of Homer's hymn. It is in the phryggian mode, and one of my earliest efforts to compose in that mode. The song was so long that I had to make four different melodies, to keep it from being too boring. It was from THE REPUBLIC that I took the notion that the Dorian and Phryggian modes are the only two to be used in music that is to help to cause successful living. The modern musical theory's textbooks of that time, the 80's, claimed that there was no correlation between the modern naming of the modes and the ancient naming. However, Socrates described the type of psychological feeling engendered by the Dorian and Phryggian modes and the major scale, and I found that his descriptions do correlate, and do verify the modern naming of at least those two modes, so there has been some force at work unknown to the writers of modern textbooks. 17) DIANA AND HER DARLING CREW - Not sure where I got this one, but I think it was in a book about The Old Religion, in the Frostburg State University's library. The music was included, and I just switched it into the Dorian mode. It is a verily old song, several hundreds of years. 18) GLORIOUS APOLLO - This song was written during "The Renaissance," and I found it in the library in Fairfax City, Virginia, in the late 80's, when I was abiding in Annandale, Virginia, or possibly in Alexandria, Virginia. I moved about "considerable" during the late 80's, but all within the scope of Northern Virginia, DC, Poolesville MD, and Washington VA. I changed the scale to Dorian on this one also. The cassette I was using to record the "deposit" for the copyright office ran out of space before this song was over, but there was enough of the melody still on the tape to satisfy me.